Often referred as the Heart of India, Madhya Pradesh literally sits in the centre of our country and spans an area of over 3,00,000 km2. Innumerable historical monuments scatter its terrain and makes it a prime tourist location. Praised both for its heritage and culture, Madhya Pradesh has come to become one of the most popular places for world heritage sites. Apart from all the culture and heritage, Madhya Pradesh is also known for its slow, yet steady development movements. Cities like Bhopal, Indore, Khajuraho, Gwalior & Ujjain have come a long way. The good people of Madhya Pradesh are now more active in the real estate business and this has lead to many people thinking of rental homes as a resort. Its capital city, Bhopal and its largest city, Indore, showed huge demands for rental agreements and other real estate related documents. This brings us to our topic – How do you make a rental agreement in Madhya Pradesh? The procedure is no different from that of other states. The conventional method would involve the landlord and tenant entering into a discussion about what to and what not to include in the rental agreement. Once they agree upon the clauses, they may visit a lawyer who will draft the agreement for them in the standard format and then get it printed on Stamp paper. The tenant and landlord then validate the document by placing their signatures along with that of two witnesses. This version of the agreement is the registered at the local Sub-Registrar office making it legally valid and enforceable. Although this is the most widely practised method, some folks may have neither the time nor the money to go lawyers to get the drafting done. Also, there is also the question of the lawyer’s skill to draft a comprehensive agreement that would cover all contingencies. 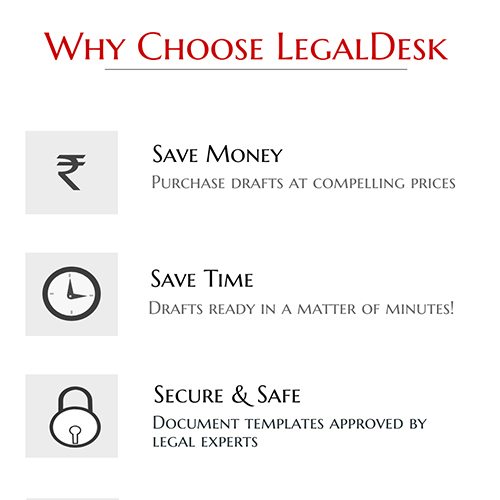 That’s why our pre-drafted, ready to use, legal expert verified lease template is a safer option. When you wish to make your documents legally valid with a Govt. seal, the tax you pay for it is called Stamp Duty. This tax varies from state to state and is often a nominal fee. In the state of Madhya Pradesh, Stamp Duty for lease documents is charged at 8% of total rent+deposit. In late 2012, the Govt announced that e-Stamp papers may be introduced at the beginning of the next financial year. Although the state did introduce it, a major chunk of the population still stick to the use of conventional stamp papers. The e-Stamp paper trend is yet to catch on. The process of registering was introduced with the idea of deterring frauds. If the document is properly registered then it means that the document has indeed been signed by parties mentioned in it and that it has not been forged or tampered with. This also reveals every information related to the property being discussed in the agreement so lawsuits and feuds going on about the property will become a matter of public record. The registration charges in the state of Madhya Pradesh are 1% of total rent+deposit. Commercial leases: Commercial leases are signed between business or between a business and an individual. They span longer durations and rarely stick to a standard format. As the needs of the business under question changes, the format of the agreement also changes. Such leases involve large sums of money and people involved rarely overlook steps like Stamp Duty and Registration. Long Term Leases: This is typically a type of residential lease except that the duration is really long, often spanning years. Such leases may involve large lump sums being paid upfront although the money is returned at the end of term. Unwise if parties involved skip proper Stamp Duty or Registration as the penalty for doing so may turn out to be expensive. 11-Month Rental Agreement: This is India’s most commonly used format of rental agreement. As the name suggests, this agreement is signed for a period of 11 months with the option to renew at the end of term. A few months worth of rent is collected as security deposit but apart from that there is no other lump sum payment involved. A rental agreement is the focal point of the whole rental transaction. If drafted well, the whole experience would be smooth, otherwise a lot of friction could arise between the parties involved. Here are some clauses that should never be omitted from your rental agreement even if parties involved are thick friends. Charges for rent, maintenance & security deposit – Monthly rent, maintenance fee and security deposit to be paid upfront must be discussed and agreed upon in advance. If it is not written down in word, the landlord could change his word and quote some other amount and there will be nothing that can be done. Animals – If the landlord is averse to the idea of keeping pets within his premises, he/she must make that clear through the contract. Otherwise, nothing can be done if the tenant decides to house whatever animal(s) he chooses to. Penalty for late payments – If the tenant refuses to pay rent within the stipulated time, the penalty for it should be clearly spelled out in the contract. Breach of contract – If either party deviates from the contract and breaks any terms, what follows next must be included in the contract. Both parties are also free to include a method in which the conflict should be resolved. Lock in period – Lock in periods prevent either party from breaking the contract immediately after the rental transaction begins. It is essentially the minimum duration of time during with neither the landlord nor the tenant can terminate the rental agreement. Food habits – Although it is not technically right to tell your tenant what to eat and what not to eat, landlords who do not encourage consumption of non-veg/alcohol/narcotic drugs within the premises are expected to make that clear through the contact. Security Deposit: This is a lump sum paid before the tenant moves in. This is very similar to caution deposit and is collected in advance as a precaution against harmful incidents. Should the tenant cause any damages to the property or skip rent payments, the losses will be compensated from this amount. This amount is refundable after valid deductions are made. Token Advance: Token advance is a small sum of money paid by the tenant to the landlord with the idea of blocking the place for himself. Once this amount is paid, the landlord is expected to take the house off the market and discourage other potential tenants. When legal battles ensue between tenants and landlords, what matters most is the rental agreement. If this agreement is vague or badly drafted, Lord help the parties involved. Here are some things that should be checked before you even draft the rental agreement. Owner’s background & authenticity: While it is difficult to check the owner’s background, authenticity can be easily checked. Ask for utility bills or title of ownership document. Be vary if the person claiming to be the owner fails to produce any such documents. Payment receipts: Collect receipts from the landlord for every payment you make. This will be solid proof for the fact that you did pay your dues on time. Registration: Register your document at the local Sub-Registrar office to be on the safer side. Unregistered documents count as collateral evidence only should a dispute arise and matters get taken to court. Visit our pre-drafted, ready to use, lawyer verified rental agreement. Fill in details of tenant, landlord and the property being considered for rent. Include important clauses, monthly rent, maintenance charges and any other factor you want. Print the soft copy you get after you make the payment or allow us to print it on Stamp paper and deliver to an address of your choice.